Intense Herbal Cleansing. Instant Acting! When it's time for intensive cleansing, you need the good stuff - The Stuff Extra. The Stuff Extra has been scientifically engineered to work with your body's natural cleansing processes and kick them into overdrive - toxins and impurities don't stand a chance! Filtered Water, Fructose, Citric Acid, Natural Flavors, FD&C Blue #1 & Red #40, Potassium Sorbate & Sodium Benzoate (as preservatives). Burdock (root), Milk Thistle (leaf), Nettle (leaf), Uva Ursi (leaf). Ingredients: Filtered Water, Fructose, Citric Acid, Natural Flavors, FD&C Blue #1 & Red #40, Potassium Sorbate & Sodium Benzoate (as preservatives). Pregnant or breastfeeding women should consult their physician before using this product. 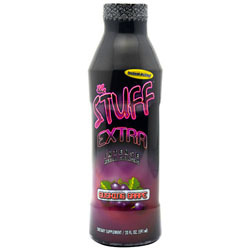 The Stuff Extra is not intended for children.